New York-based Celano Design Studio brings Chicago’s industrial past to River North with Tippling Hall, its stunningly designed beer hall, cocktail lounge, and wine bar all-in-one concept. Celano Design Studio worked with architect of record, IPSA Corp in collaboration with Mercadito Hospitality and Tippling Bros. Opened Monday, Oct. 13, Tippling Hall is reminiscent of a classic beer hall with weathered yet warming design elements. 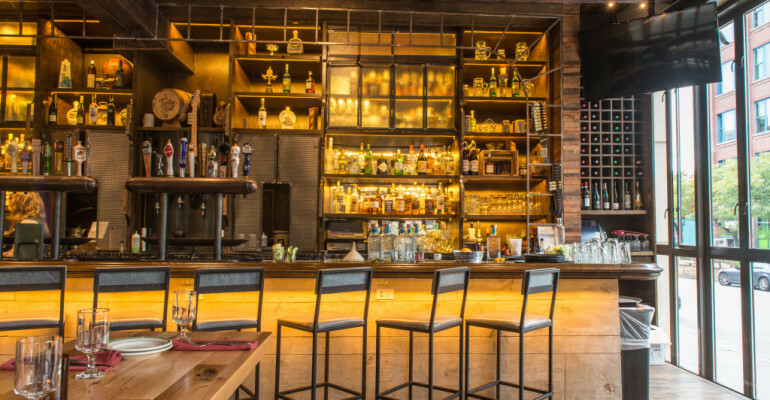 The newly opened space designed by Celano Design Studio and conceptualized with Mercadito Hospitality and beverage-consulting firm Tippling Bros. offers River North global comfort food and late-night dining. The 5,000-square foot space boasts communal tables, thick overhead beams, and plaster artwork. The Design Celano Design Studio created a comfortable and intimate environment inspired by Chicago’s industrial past. Celano’s design team stripped the interior down to its bones to expose the structure’s beautiful brick walls and wood ceilings, keeping the building’s integrity alive while blending modern, edgy elements into the design. Above the entrance at the staircase floats a cage-like light fixture made of vintage flasks, each engraved with the names of Mercadito team members. Between the bar and dining areas, the design team installed panels that pivot open to let the energy flow freely between the spaces. In the dining area, bench seating and communal tables create a beer hall vibe that can accommodate every experience from happy hour to dinner to late-night drinks. The leather- wrapped light fixtures and fritted glass in the pivoting panels follow an industrial theme, adding a touch of sparkle and creates an amber glow throughout the space. Artwork by artist Ernie Valdez appears throughout the space, from graffiti patterns on the walls leading to the restrooms to the dining room’s plaster wall depicting the Chicago skyline.